To create your website review questionnaires, go to Website Reviews under Analyze on the menu. The Website Reviews dashboard appears where you can view all website reviews created through your account. Next, in the upper right corner of the dashboard, click Create. To set up the website review, type a title for the review by clicking the pencil icon against New Campaign. 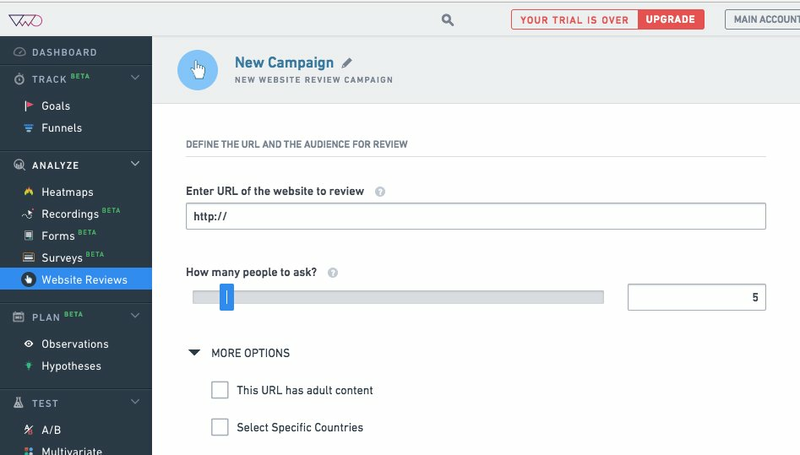 The first step in the process is to specify the URLs of the webpages you want to include or exclude from the review. Type the URL of the website you want to review. Specify the number of people you want to include in the review. If your website has adult content, under More Options, select the This URL has adult content check box. If you want to exclude or include users from certain countries taking part in the review, select the Select Specific Countries check box. To proceed to the next screen for adding review questions to ask, click Next. You can add both Multiple Choice Questions (MCQs) and text-based answers for review questions. Enter the questions and then select a corresponding response type for each question. To get started, refer to the sample questions displayed in the right panel of the screen. After adding the review questions, click Next. The Finalize screen appears where you can run the review immediately or schedule it for a later time. On this screen, you can configure advanced settings for the website review, add name, notes, and labels for the review exercise. VWO uses the service of a third-party vendor to send out the questionnaire and collect feedback on the website. For this purpose, you need to purchase credits to run a website review. The credits are calculated based on the number of participants in the review multiplied by the number of questions asked. After purchasing the credits, proceed to the next screen to run the review right away, or schedule it for a later time. In general, a website review takes about 2–4 days to collect the specified number of responses and generate a full report.